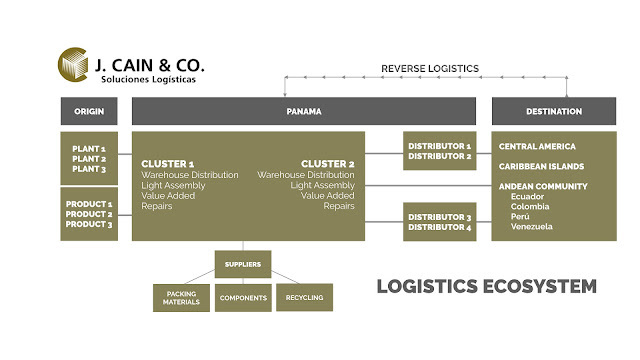 Panama throughout its history has stood out as a distribution center, the transit route by nature, the great connection. The country is focused on developing the infrastructure, processes and systems that allow it to remain the best option to serve as a logistics hub to serve Latin America. For this, it is important to update the offer of services so that it adapts to the requirements of commerce and consumers, which are evolving faster and demanding different things and more services to the supply chain. Consumers look for immediacy in the availability of what they want to have, products configured according to their personal requirements and without paying more for this. Panama must create the conditions so that electronic commerce for Latin America can be offered with the times, costs and variety of offers that are available in the main production centers such as China, the United States and Europe. Until now, Panama has focused on taking advantage of its geographical position to develop ports, free zones of trade and distribution. This has motivated airlines and shipping companies to use Panama as a regional point of consolidation and transshipment. Thanks to this, we can say that in Panama we have the best transits/times from origin and the best frequency, transits and times to Central America, the Caribbean and countries of South America that are part of the Andean Pact. By consolidating all these components, Panama has become the best connection and the best option to operate a regional distribution center, a concept that for years has been a competitive advantage for large multinational companies such as Pfizer, Glaxo Smithkline, Bayer, Merck, Sanofi , Eli Lily, Zoetis, Panasonic, Philips, Samsung, LG, Sony, Diageo, Payless, Under Armor, Bosch, among many others. To meet today's demand for consumer services, in many cases it is required to configure the product closer to the consumer. The best example of this is the technology industry and we already have companies like Huawei and Hewlett Packard that are potentiating the advantages of Panama. To make this really successful, we must promote the development of a logistic ecosystem. Create clusters where we have raw material suppliers, manufacturers of brands by industry, logistics service providers and distributors working in an integrated and coordinated manner. It is necessary to have the availability of components to produce the inventory according to the demand of the moment, allow the large distributors of the region to supply the greater percentage of the mix of products they offer, and have the wide and competitive transportation options that allow having the offer of products in the indicated place, when the consumer wants it and at the attractive price to motivate their purchase. Creating these clusters would be an attraction for more multinational companies to put their distribution centers in Panama and to increase the demand for labor for light manufacturing services and added value.Let's keep innovating and keeping Panama as a key link in the strategic supply chain for Latin America.